The second day will be interactive between the participants and the experts, 3 sessions of oral communications will be organized in which participants will debate with the experts. Abstracts and Posters presented during EUS-ENDO will be published in Endoscopic Ultrasound review. Debates around Hot Topics as Pancreatic cystic tumor management, EUS-FNA or FNB, Barrett’s esophagus will be organized during this second meeting. 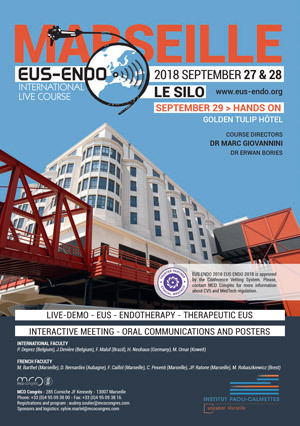 The third day will be dedicated to hands-on, 6 stations will be available for ERCP, EUS-FNA, T.EUS ( Pseudo cyst drainage) which permit to use a different kind of accessories as Axios, Spaxus, Nagy stents and many other EUS materials.